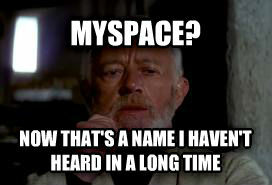 I thought Myspace had shut down to be honest . The sad thing is, Facebook was touted as clean and simple, something myspace wasn't. Facebook now is worse than Myspace was in it's prime. All of the nefarious tracking, mini games and complexity promoting hate and divisity. Myspace was better for blogging.... at least your posts didn't disappear into the ether after a few days, but that was before the twitter myspace useless post spam. Couldn't they just email the NSA for the data backups? wow, didn't even know myspace was still up and running tbh lol. I honestly didn't know Myspace was still around. I thought it got shut down in 2013. Oh Thank goodnums. Its finally GONE. That one picture of me in a tutu pointing a plunger at the sky. Its GONE. CONFIRMED. Nah, it will be in an archive somewhere. Once something is on the internet, it's there forever. It's also why I eat my bacon in the dark ???????????????? And that's both a very calming and terrifying thought at the same time. Waiting for Facebook to die a similar death to MySpace and Bebo. Biggest website on the internet but 75% of its content is trash. TBH I think this gives them a new option to clean up, and restart as a cleaner safer environment than facebook. I doubt that will happen, but you know, at least something to replace evil facebook? You think it'll be any different? Complexity and "turning bad" are inevitable side effects which go hand in hand with the lucrative opportunities that arise in parallel to userbase growth.